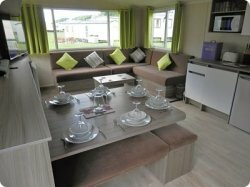 This spacious 3 Bedroom luxury caravan is ideal for families who want to be near to all the amenities the site has to offer. It has excellent views over the play park, and is only a stones throw away from the Holiday Park complex, shops, restaurant.. 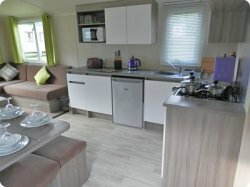 The caravan is fully Double Glazed and has Gas Central Heating in all rooms. Find the same caravan on other web sites cheaper & we will Beat the Price! There is a separate WC and Shower Room. 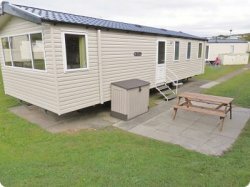 The caravan sleeps 6 in 3 bedrooms (1 double, 2 twin bedrooms). The lounge is spacious and is equipped with Flat Screen 40 inch LCD TV and Blue Ray DVD Player with Blue Tooth Sound Bar plus Free View. The large corner suite style sofa is wrapped round the van living area and has scatter cushions. 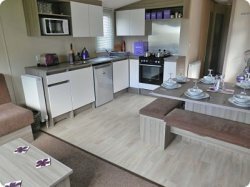 The modern fully fitted kitchen has a gas cooker with cooker hood, full size fridge with freezer and microwave. There is also a colour coordinated toaster, electric kettle and storage jars. The Dining Table has bench style seating for 6 persons. There is cutlery and crockery etc for 8. The Master Bedroom has a double bed with double wardrobe and overhead storage. 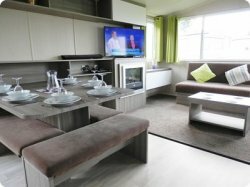 It is equipped with a 24 inch LCD TV with built-in DVD Player plus Free View. It has 2 colour coordinated bedside lamps. The Twin Bedroom has 2 single beds, a wardrobe, overhead storage and a bedside cabinet with a colour coordinated bedside lamp. The second Twin Bedroom has 2 single beds, a wardrobe, overhead storage and a bedside cabinet with a colour coordinated bedside lamp. The Shower Room comprises a full sized shower with wash hand basin. There is a separate WC with wash hand basin. A vacuum cleaner, iron and ironing board are provided for your convenience. A Fire Extinguisher and smoke alarm and carbon monoxide detector are provided for your safety. This is a strictly NO SMOKING/NO PETS Holiday Home. These are actual photographs and are not Catalogue Photographs.